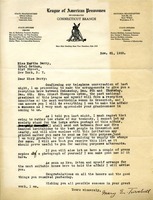 The letter is a confirmation of a request to give a reception in Miss Berry's honor between December 5-6. The society is going to mail invitations to the reception and is appreciative of the assistance with postage being offered by Miss Berry. 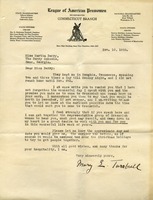 Miss Berry may send printed matter to be enclosed with the invitations. There is also a request for press copies and a photograph of Miss Berry.